Elizabeth Legge works on Dada, Surrealism, and contemporary Canadian, U.S., and British art. 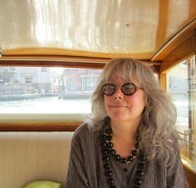 She has written for a number of journals including Art History, Word and Image, and Representations. She has written books on Max Ernst and psychoanalysis; and on Michael Snow’s radical New York film of the 1960s, Wavelength. Her intellectual interests include: the ways that artists have worked with language; and the instrumental uses of religious, racial, and national stereotypes and rhetorics in art. She has been a visiting professor at the Humanities Centre at Johns Hopkins University.